Gov. Paul LePage introduces Republican presidential candidate Donald Trump at a rally in August 2016. After remaining largely silent on the past weekend’s violence in Virginia, Gov. 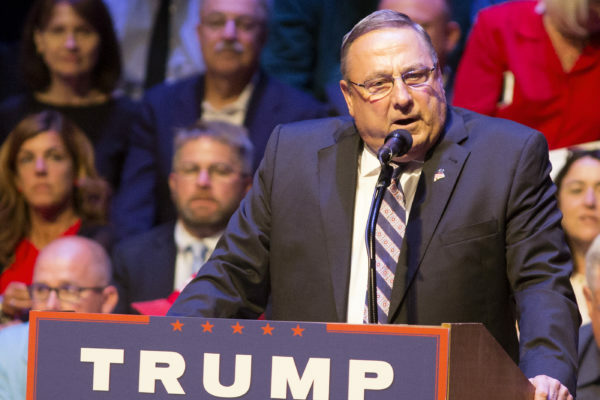 Paul LePage erupted Thursday on the radio. Maine’s Republican governor echoed President Donald Trump’s reaction to the Charlottesville conflict, assigning equal blame to white supremacists and counterprotesters who showed up to oppose a rally against removing a statue of Confederate Gen. Robert E. Lee. LePage, in a fiery interview on WGAN, said he has taken criticism from Mainers in recent days for his delayed response to the events — which he said he didn’t know happened until Tuesday because he doesn’t watch television or read newspapers. He angrily rebuked the notion that his silence on Charlottesville and Trump’s refusal to single out neo-Nazis for harsher criticism were tacit signs of support for white supremacist groups. Trump, who has been the target of withering criticism for his response to the Charlottesville events, said during a Tuesday news conference that both sides of the conflict were equally to blame. LePage’s interview Thursday morning was similar. In a response about whether Virginia law enforcement agencies, who have been criticized for not dispersing the crowds, reacted properly, LePage said his reaction would be different if similar violent clashes happened in Maine. LePage has faced criticism for what some have called racially charged comments at several times during his tenure. In January 2016, he unleashed a firestorm when he used racial terms to describe Maine’s drug problem, saying that drug traffickers from Connecticut and New York come to Maine and impregnate girls who are “young” and “white” before leaving the state. In August 2016, he used similar framing when he made comments about black and Hispanic people coming to Maine to sell drugs. When a television reporter suggested that Rep. Drew Gattine, D-Westbrook, called LePage a racist (Gattine did not), LePage exploded. He left Gattine a profanity-packed and threatening voicemail. LePage’s take on opposition to removing Confederate statues also mirrored Trump, who made a “slippery slope” argument that removing statues of Confederate leaders like Lee would result in a call for the removal of monuments to Presidents George Washington and Thomas Jefferson, because they owned slaves. On Thursday, LePage said both sides of the Virginia clashes are “equally bad,” including those who want to take down Confederate statues and monuments. He compared the movement to remove Confederate statues to a hypothetical call to take down memorials to the Sept. 11, 2001, terrorist attacks. CBS poll results released on Thursday found that 55 percent of Americans do not support Trump’s blaming both sides in the conflict, compared with 35 percent who said he reacted accurately.